I had booked the day off work today for a day's hillwalking a couple of months ago, so I was pleasantly surprised to discover that the weather forecast was actually pretty good :-) It had been well over a year since I'd last been hillwalking in Snowdonia so I decided to rectify this today by going for a walk in the Arenigs near to Bala. I'd only previously walked in the Arenigs on three occasions before (in August 2007, June 2008 and January 2009), so I decided a return visit was long overdue! 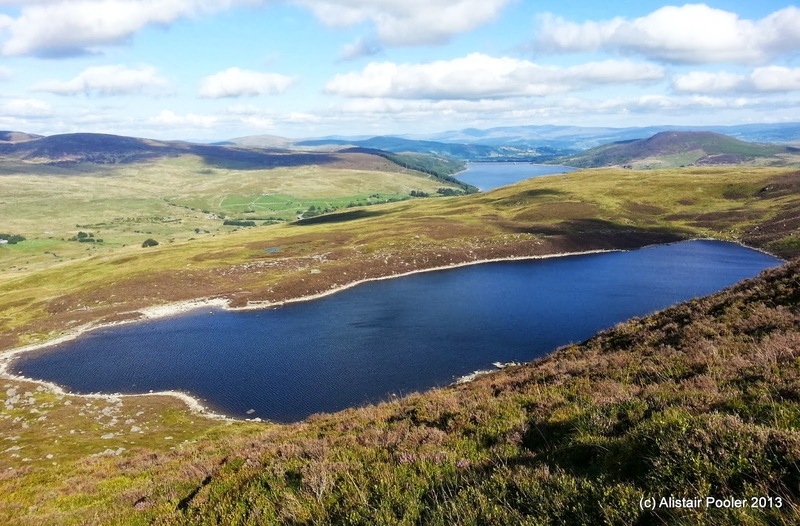 I set off walking from the road alongside Llyn Celyn shortly before 11am and followed a vehicle track up through the forest for a few hundred metres before reaching a line of pylons and open country. 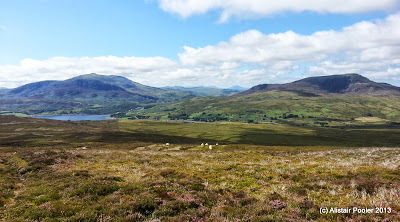 I continued to ascend on a good track with excellent views over the purple heather towards Arenig Fawr, Arenig Fach and the northern Snowdonia hills beyond. When the track reached a local high point and turned east I forsake the track and ascended through the heather to reach the cairn on the summit of Foel-boeth (Dewey). The views from up here were excellent and I stopped by the nearby little-used looking windshelter for a spot of lunch whilst deciding my onward route! Rather than risk injury from the fence, I opted to follow it eastwards to the Nant y Coed, which I was able to cross on a small stone slabbed bridge. I now had an unpleasant steep ascent through deep heather to reach the top of Brottos, where the ground was surprisingly spongy despite being nearly bone dry. A further few hundred metres brought me back to the track, which in hindsight I should have followed all the way! 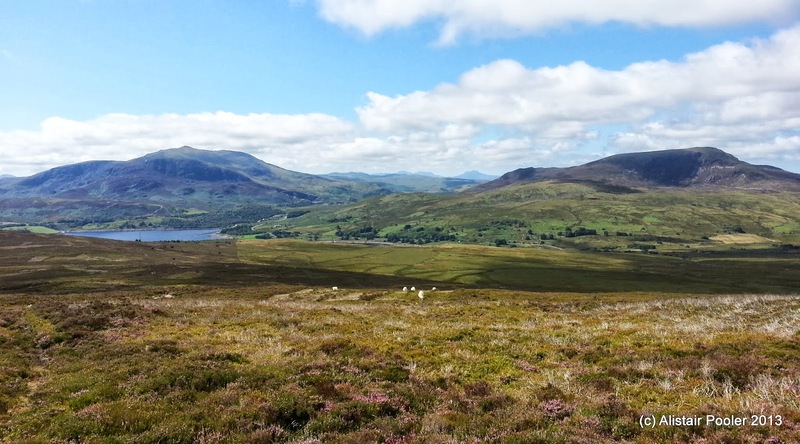 Shortly after joining the track I met two other walkers heading for Carnedd y Filiast - however this was not my next planned hill. Instead I followed the track just below the summit to the east through lots of lovely heather that seemed to be alive with butterflies! After the track ran out a further half a kilometre of so of walking along a faint path over the moorland brought me to the summit cairn of Waun Garnedd-y-filiast (Nuttall). After feeling suitably rested I headed westwards alongside the fence, following a bit of a faint intermittent path to reach the boggy area named on the map as Ffynnon y Waen. However given it was a dry day in summer, I didn't have too much trouble keeping my feet dry - although I suspect it would be a different matter if the rain was lashing down! I crossed the headwaters of the Nant y Coed, which appeared to just emerge from beneath the fence! And continued westwards to a small cairn, from where I followed a faint path southwards to reach the summit of Carnedd Llechwedd-llyfn (Nuttall). Returning to the fence, I descended following it WSW past occasional boundary stones (marked with RP 1866). To the NW lay the vast area of moorland known as the Migneint, which is apparently one of the largest areas of bog and heather in Wales and it certainly looked pretty large from up here! Soon I caught up with the two other walkers I had seen earlier and we walked together for a while to reach the Afon Gelyn, where I stopped to don gaiters in an attempt to keep my feet dry whilst crossing the river - although unfortunately this failed and the water began to seep through whilst I was wading across! Once back on dry land I stopped for a quick break whilst deciding my plan of attack for the ascent of Arenig Fach. I initially opted for the slightly higher ground above Boncyn Crwn but this only ended up with me wading through deep heather in shorts, which was quite unpleasant! In the end I decided to head southwards to the Trinant burn, where I was able to pick a slightly less heathery route of ascent following a branch of the burn southwards. Near the source of the stream I was forced to return to the deep heather for a steep ascent to gain the spur overlooking Llyn Arenig Fach. Here I picked up a faint path, which I followed up the steep heathery ground with excellent views back northwards over the vastness of the Migneint moorland. After occasional rocky sections, the ground relented as I reached the summit plateau area. A few hundred metres further brought me to the trigpoint, cairn and windshelter on the summit of Arenig Fach (Marilyn, Nuttall). After admiring the fantastic views from up here I stopped for a quick bite to eat in the impressive windshelter next to the cairn. The two people I met earlier appeared a short while later and after chatting to them for a few minutes I started my descent. The descent along the faint path SE along the fence line was unpleasantly steep in places and care was needed in a number of places as the fence not only had barbed wire on the top but also on the bottom too, which seemed somewhat unnecessary! Eventually the angle eased and I headed eastwards over Bryn Du with excellent views over Llyn Celyn. The ground became progressively more reedy as I descended until I was only a couple of hundred metres above the road. However the direct route to the road looked to be quite unpleasant given it was through steep, pathless bracken and woodland. I stumbled upon an old track, which turned out to be a public footpath, and I followed it northwards to reach the road near the corner. After a little over half a kilometre of road walking I came to the Capel Celyn memorial chapel, which commemorates the flooding of Capel Celyn village and the surrounding Tryweryn valley to create the Llyn Celyn reservoir in 1965. Some glorious pictures of the views too. I was quite pleasantly surprised about how good the walk was and how quiet the hills were! What a lovely walk. It is quite a few years since I went walking in Wales and there is much there to yet explore. I used to go more from college when ran the fell walking club as much closer than I am now. That was rather a long time ago! Must be due a visit. Thanks Heather it was a lovely walk, up quite quiet hills :-) I think it was my first hillwalk in Snowdonia for almost two years! I agree that that there is much yet to explore - there's still a lot of Wales that I've not walked in yet!